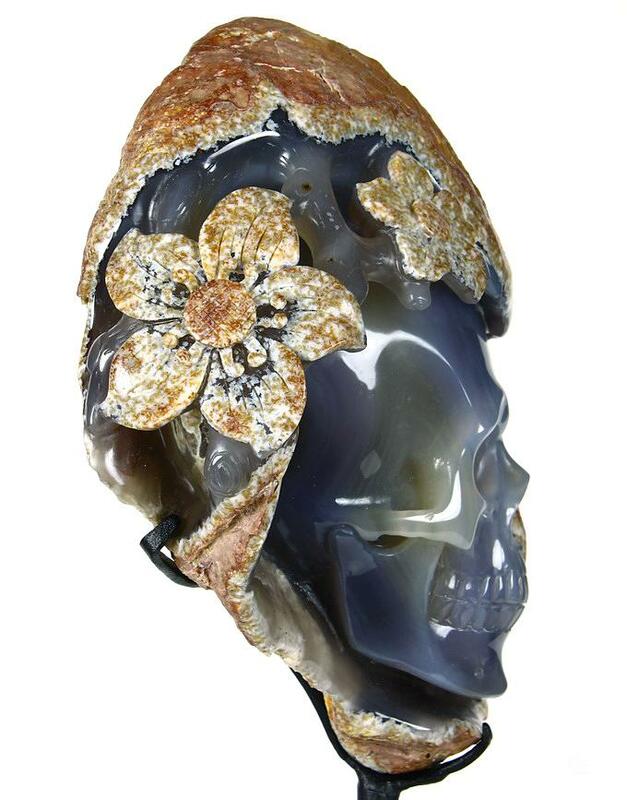 Fruit of the Vine is a marvelous crystal skull sculpture carved from a blue-gray Brazilian agate specimen. The rough exterior resembles the rind of a fruit, protecting the carved and polished sustenance within. 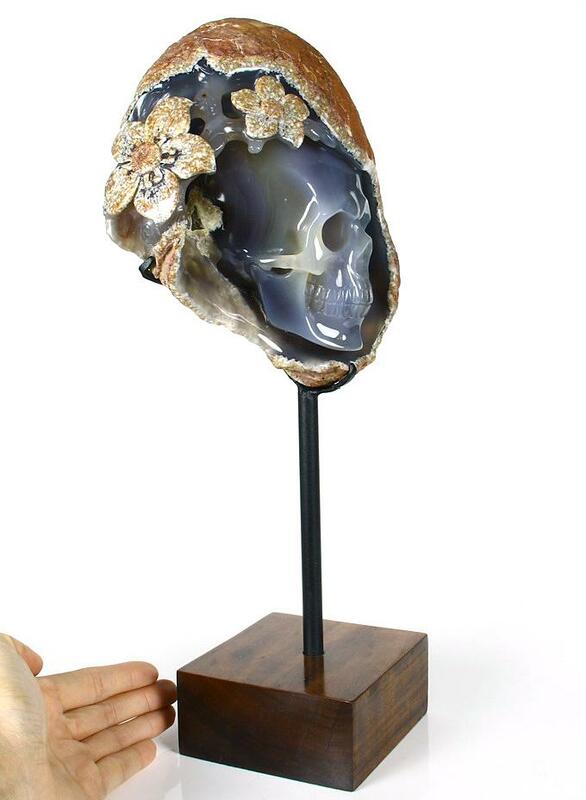 The single piece Fruit of the Vine crystal skull sculpture features a beautifully detailed crystal skull beneath a flowering vine, the polished flowers still retaining the color and pattern of the weathered surface of the agate. 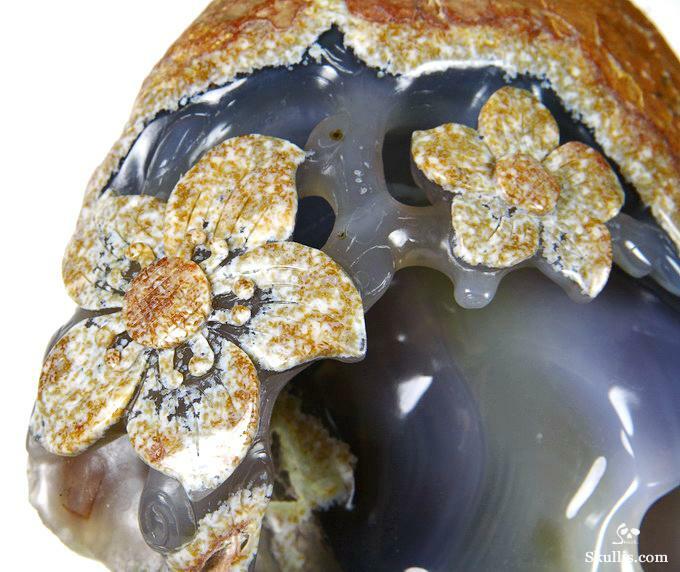 The translucent agate exhibits a subtle shift in natural coloration from the outer blue-gray to lighter yellow and white areas as the fortification layers move inward toward the center of this breathtaking crystal. 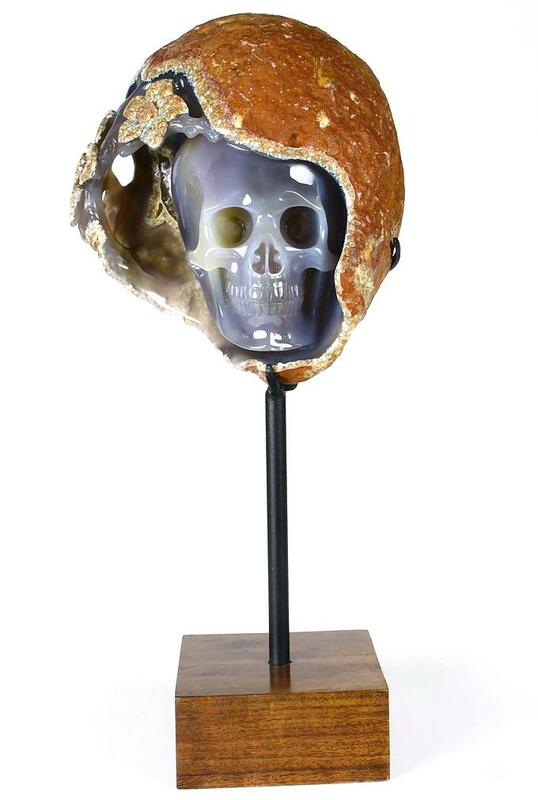 An outstanding work of fine art, the Fruit of the Vine agate crystal skull sculpture measures 5.9 x 5.9 x 9.3 inches (150x150x235 mm) and is displayed on an iron work mounting rising from a finely polished wood stand which measures 6.0 x 6.3 x 5.2 inches (152x159x132 mm). 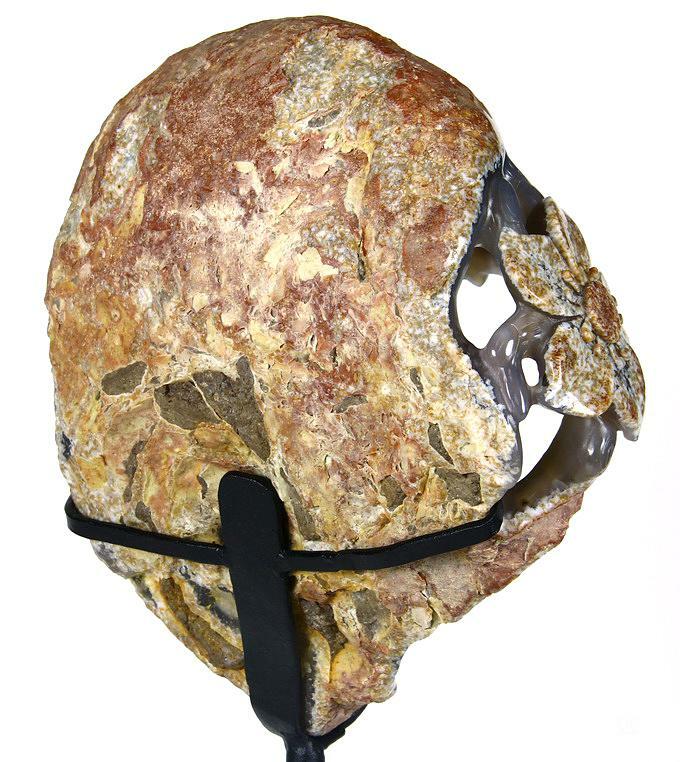 The weight of the Fruit of the Vine agate crystal skull on the stand is 6.18 pounds (2805 g). The Fruit of the Vine facilitates growth, encouraging our desire, as physical beings, to reconnect with the source energy that is our origin. 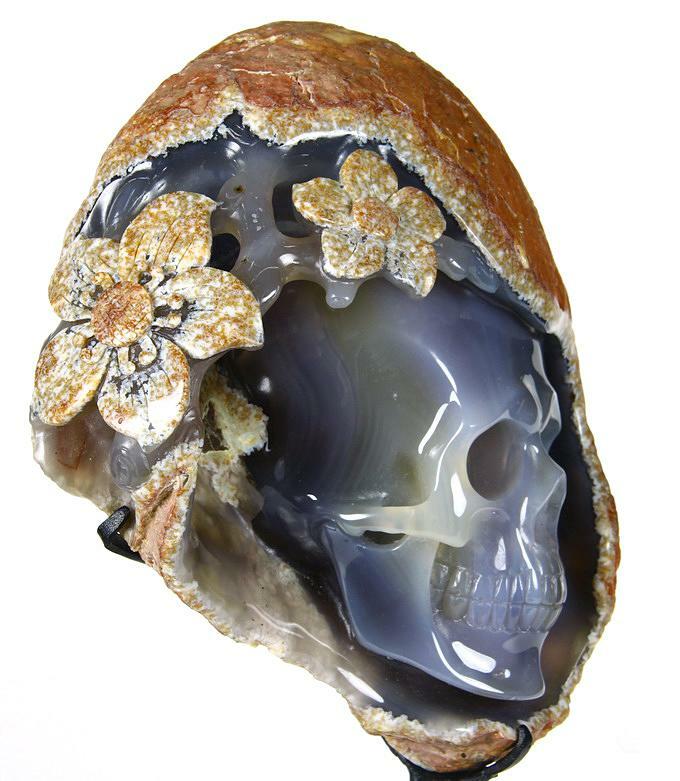 The Fruit of the Vine crystal skull reminds each of us that attaining enlightenment is simply a process of remembering what we are and what we already know. The Fruit of the Vine crystal skull is representative of nature's tendency to replicate the divine perfection of our spiritual origins. At the first stage of development, physical structure is primitive and simple, yet, as growth begins to take place, patterns develop, demonstrating life's moving closer to joining with the unified source, and becoming more divine in the process. 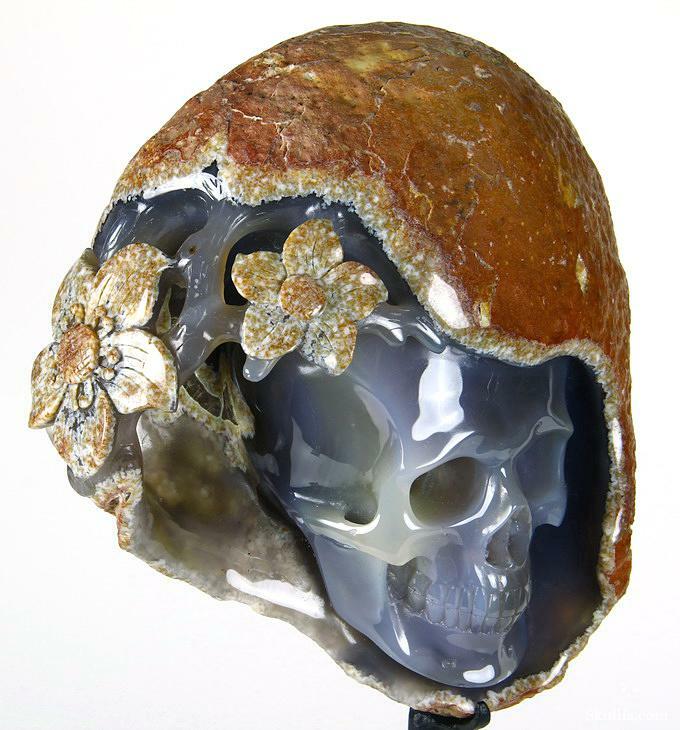 The Fruit of the Vine crystal skull helps us to recognize that this happens within each of us, encouraging our acceptance and comprehension of our very unique and individual expression of our inherent natural perfection. Fruit of the Vine inspires each of us to continue with our growth process, especially during challenging and difficult experiences, while also inspiring our understanding that there is never a need to improve ourselves or become a better person because we are already the expression of a unique version of spiritual perfection. 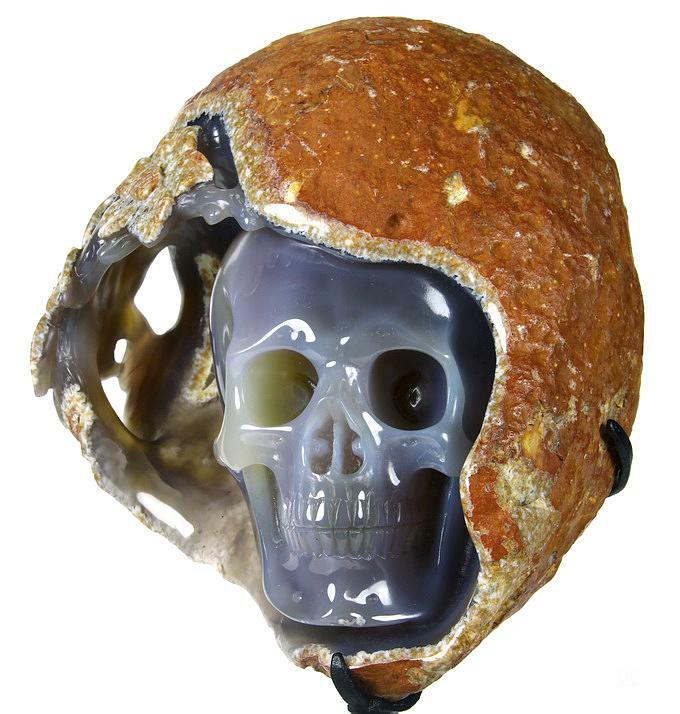 The Fruit of the Vine crystal skull helps us to recognize there is a difference between thinking we need to correct what we perceive as our imperfections, and allowing for the process of growing and unfolding into what we already are to occur. Agate has long been used as a stone of protection, to stimulate analytical capabilities and precision, for providing for perceptiveness to situations, and for awakening ones inherent talents and adroitness. It is also used to avert, and protect from, lighting and stormy weather (physically and metaphysically), and it is considered to be very effective for the protection of children, especially protecting children from falling. It has also been used to produce inspiration from, and connectedness to, the spiritual worlds. Agate raises one's consciousness, builds self-confidence, and assists one in choosing one's friends carefully. Agate provides strength, helps us to have patience and courage, and its calming effect allows for finding inner peace. Agate has been used to promote marital fidelity and stability within ceremonial activities, for balancing body, mind, emotions, spirit, and yin/yang energies, and as a stone of harmony and unification of all people. Agate symbolizes benevolence and good will, with these originating from the nurturing energy within the stone. Agate can alleviate hostility, irritability, and boredom, while enhancing one's generosity, responsiveness, and receptivity. Agate is often used as a gazing tool for divination and meditation. 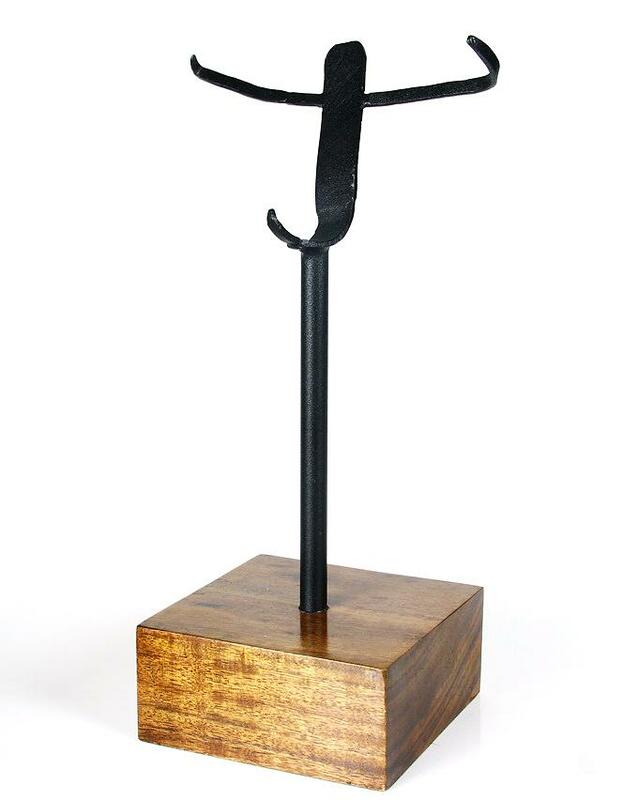 It assists in examination of the self and the learning situations that bring about growth. Agate also assists in abating stress and anxiety. Agate is used to bring prosperity on all levels, and is considered an excellent stone for artists and students, as it amplifies creative and intellectual thinking. Agate heightens and intensifies energy, sharing it when it is required, and storing energy when it is not needed, enhancing one’s durability and endurance. Agate gives one emotional strength, alleviates fears, and dispels envy and desire through the grounding of emotions. Agate teaches acceptance of one's thoughts and feelings which helps one to overcome the emotions one desires to be free of. Agate's nature of bringing harmony allows for removing and releasing bitterness, resentment, ill will, and the desire for vengeance and retaliation, teaching one to learn and practice forgiveness. In this way, agate heals and improves relationships. Agate transforms negative energy to harmonious energy which cleans and balances the aura. It harmonizes the energy of the body with the energy of the Earth, grounding and strengthening one's connection with the planet. 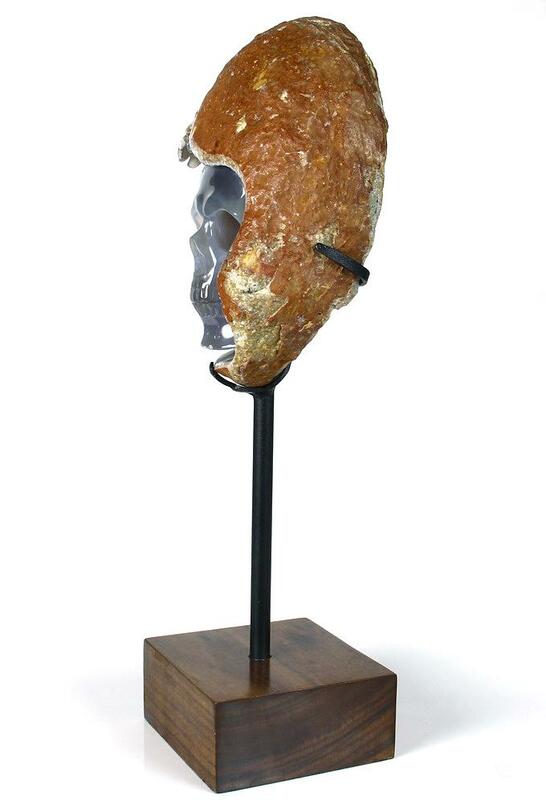 Agate stimulates the digestive system and relieves gastritis, the inflammation of the lining of the stomach. Agate is used to strengthen sight, promoting a state of good health for the eyes, and has also been used to diminish thirst. It is connected to the optimal health of the hollow organs such as the heart, lungs, stomach, intestines, and uterus, and is used to heal skin disorders. It has been used to alleviate itching caused by insect bites. Agate assists the heart and blood vessels, strengthening the heart and also healing emotional discord that may be blocking one’s ability to accept love. Agate has been used to cure fever and reduce the symptoms of epilepsy, and may help some people with somnambulism. Agate is also used to cleanse the lymphatic system and the pancreas. NOTE: Skullis does not prescribe treatment for medical issues. 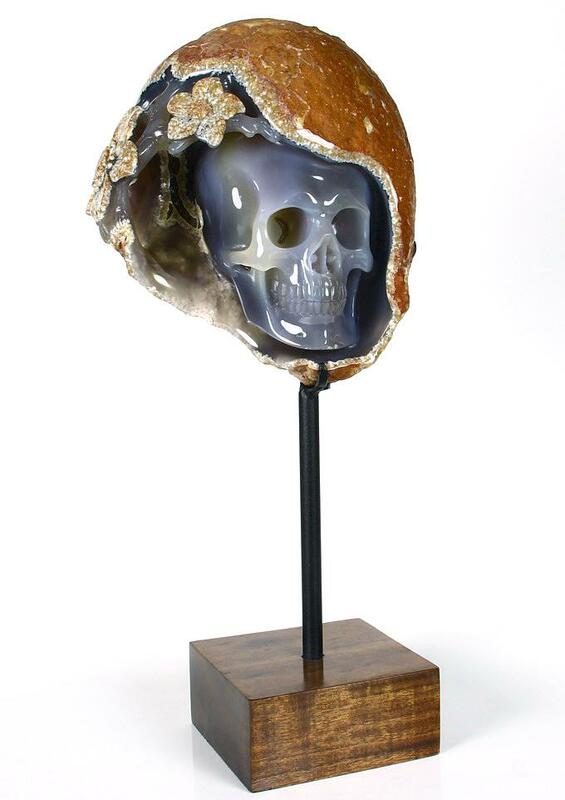 Skullis offers information for reference to assist with the selection and understanding of crystal skulls, including this agate crystal skull sculpture.